I hate to admit it but I love late night snacks. In the past few years, we’ve had after-parties and many dinner parties which end up becoming after-parties. I’ve cooked everything from pasta to last minute limoncello soufflé. Deep fried Oreos have also been consumed. And this one snack I made after a pint at our local Doolally Taproom turned out to be one of my favourite things I’ve ever made at ungodly hours. Bacon is the key ingredient here and after years of cooking it with oil, I learnt the correct method of cooking it which takes a bit longer but definitely worth the wait. Contrary to popular belief, you “fry” bacon in water – yes, that’s right. Adding oil and frying it just makes the bacon extra greasy and chewy. This “water frying” method renders the beautiful bacon fat and cooks it in its own porky goodness. What’s left behind can be used to fry eggs or add a hint of bacon flavour to anything you cook. So here’s the recipe to my favourite bacon sandwich. You can make it a breakfast sandwich by adding one fried egg, if you like. In a small bowl, mix together rice vinegar and sugar to soak the cucumber slices in. Let it sit in the refrigerator while you prepare rest of the ingredients for the sandwich. In a large frying pan, add a bit of olive oil and fry the onions till soft. Cook this on a low heat. Add sugar and cook till glossy and perfectly done. Remove from pan and keep this aside. In the same pan (wipe off all the oil with a kitchen paper) lay out bacon rashers and cover it all with water. Now let this cook on a high heat. The water will boil off and render the bacon fat. Without adding any additional oil to this, you will get perfectly crispy bacon for your sandwich. This whole process takes roughly 10 minutes. Mix together cream cheese, chives and capers. Once all the elements are ready, it’s time to arrange the sandwich. Lightly toast the bun and smother it with a thick layer of the cream cheese mix we just made. 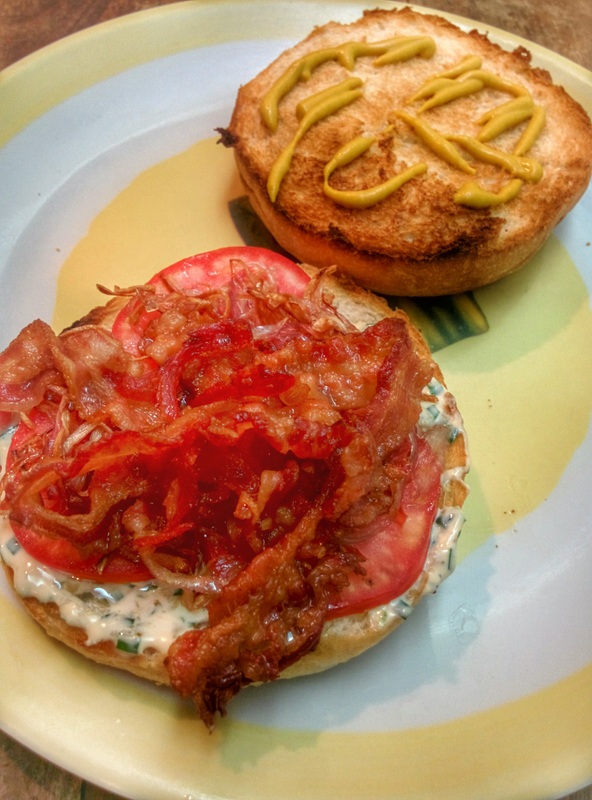 Add three slices of tomato, half of the onions, pickled cucumber, and bacon. Smear some mustard to the top half of the bun and press it together to get the perfect late night snack.